Running shoes for running on asphalt, barefoot running and indoor use. 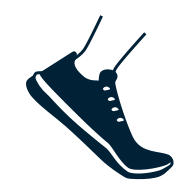 Here you can choose the right shoes according to your size, the type of running you'll be doing and whether it should be especially suited for men or women. A water-resistant design keeps moisture away from the feet. Shoes with studs are best for off-road running.